An original satirical live show guaranteed to be brave, explosive, and delightfully entertaining! As the meme-able title implies, Trumperte is the ultimate political spoof mash-up. Here, Jon inaugurates his hilarious impressions of Donald Trump and Digong Duterte, both in one night! Jon Santos as Trumperte goes to PETA Theater Center this October 2018! Just like our backlogged license plates, the great number of celebrities and dubious icons grabbing headlines in the world now are in a sever pile-up, all overripe for some wicked spoofing! But wait no more, as the unsurpassable Jon Santos relieves our cultural backlog with an original satirical live show guaranteed to be BRAVE, EXPLOSIVE, and DELIGHTFULLY ENTERTAINING! 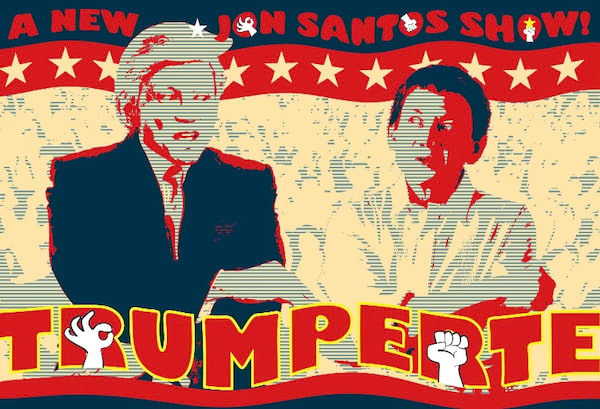 Trumperte is an extra special project for Jon Santos because the comedy act caps his 30 years in show business. This gem of a performance demonstrates why no one can replace Jon as the country's top political impersonator, and the sharpest comic barometer of society. Trumperte is written by Jon Santos, Enrico Santos, and Joel Mercado, with stage direction by Michael Williams. Do not miss this limited run.